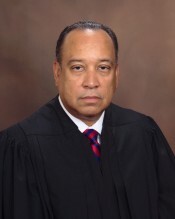 Judge Mark Anthony Scott was elected as a Superior Court Judge in the Stone Mountain Judicial Circuit in August, 2004, and presides over civil, domestic relations, and criminal felony matters. Judge Scott attended California State University, Fresno, where he obtained a Bachelor of Arts degree in Speech Communication in 1980, and graduated from Howard University School of Law in Washington, D.C. in 1984. Judge Scott is a graduate of the National Judicial College, and the recipient of the 9th Annual Justice Robert Benham Award for Community Service.